NEW CANAAN-Some of the furniture in the pavilions of the River Building were also built by the building architect, Sanaa. July 19,2016. NEW CANAAN — Grace Farms is reaching levels of international fame. The Grace Farms Foundation has been awarded the 2014-15 biennial Mies Crown Hall Americas Prize that recognizes the best works of architecture built in the Americas. 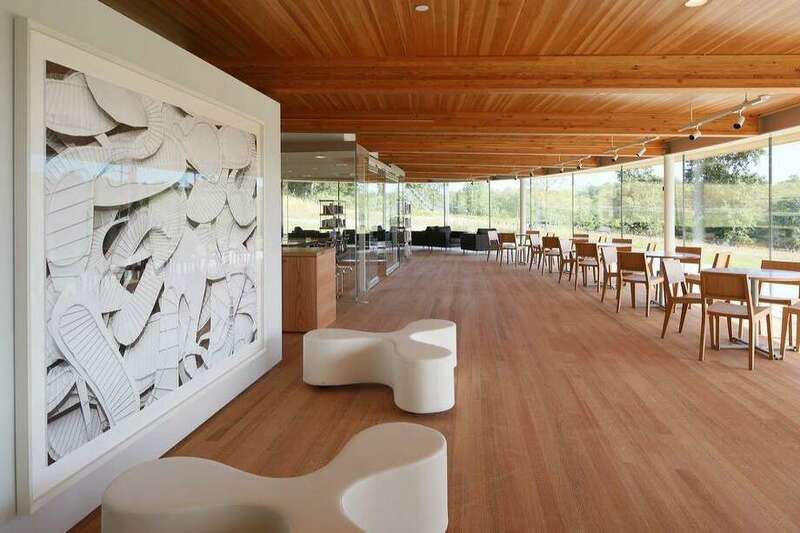 Grace Farms was singled out for its River Building, designed by SANAA, an architectural firm based in Tokyo, Japan. In July, Grace Farms was nominated for the award created by the Illinois Institute of Technology College of Architecture, Dean Wiel Arets. The foundation was recently presented with the award at the 2016 MCHAP Symposium and Award Dinner at S.R. Crown Hall in Chicago. On Oct. 19, Sejima and Nishizawa, founders of SANAA, were also recognized and named the MCHAP chairmen at IIT Architecture Chicago for the upcoming academic year. They received $50,000 to go toward research and publication. The River Building, the main structure on Grace Farms, is a winding, covered walkway that houses five pavilions. Made of wood, glass and a pressed stone walkway, the structure is designed to blend in with the nature around it. The building was chosen out of seven finalists, including one other from the United States.